This entry was posted in Blog, Concord & 9th, Crafts, Embellishments, Prima, Ranger, Sizzix, Tim Holtz and tagged 3D Projects, Crafts. Bookmark the permalink. This is really beautiful!!! I bet it is amazing in person. Very cool mixed media project, Justin! The different textures you added with the stenciling, flowers, glitter, etc. really stand out. Definitely a conversation piece for sure! Have a super Sunday!! 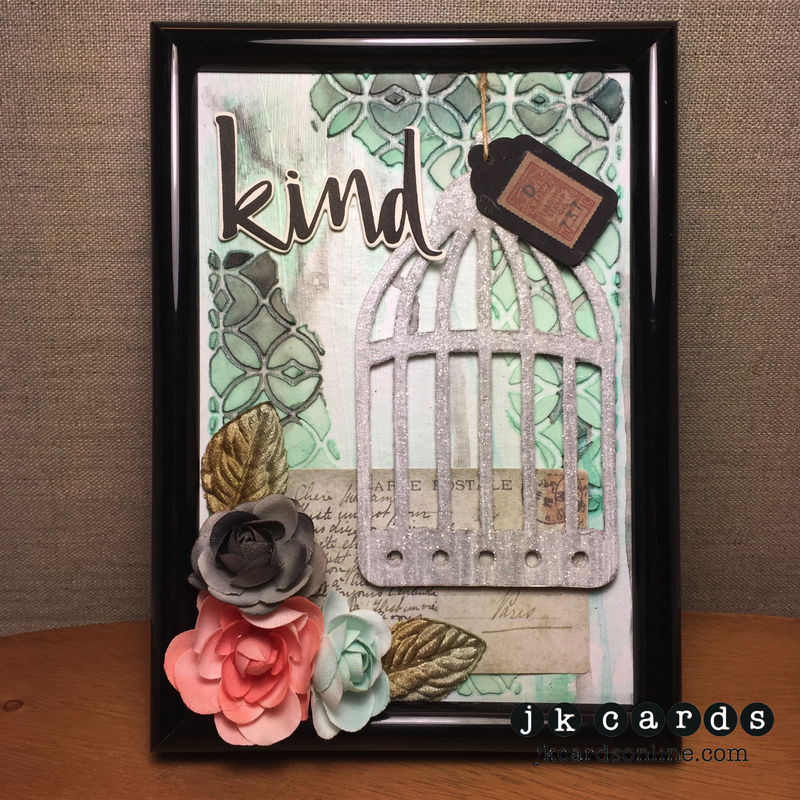 Ordinarily, I wouldn’t think cages are kind…but you made it work! Lovely again, Justin. Love your mixed media creation….. it’s gorgeous! I would love to try one myself one day. I might be Grace! I actually made it for myself! LOL! I gave the layers about an hour to dry just to make sure. All together I think it took about 6 hours including drying time. I did have a fun relaxing day and I did need it! Eating Fresh for lunch means Subway! WOW! I alays look at the picture before I read your post. This screamed Tim Hoktz to me, i’m glad i was right but it tells me i have way too much Tim Holtz stuff! I love his products. This is beautiful, I love the colors you chose. Quiet Saturday, I did some light housecleaning, very light, lol. Did get one of my DT creatins done, then hubby and i saw “The Finest Hours” Pretty good, intesnse at times. Yes Linda, it definitely screams Tim! LOL! I did have a lot of fun putting this together! Thank you! Quiet Saturday’s are nice! Glad that you got one of your DT projects finished! Oh, I’ll have to look into that movie! Beautiful! Love all the textures and layers. TFS! I met you yesterday at the ink pad! Glad we got to talking and you gave me your blog to check out. I’m enjoying looking threw it! Always great to meet a fellow stamping up demonstrator!